We work very hard to get your order to you as fast as possible. Read below to understand our shipping timelines and know when you expect your order to arrive. The delivery timelines described herein are only estimates by the carriers and are calculated from the time your order ships from the Depot or order fulfillment centres, and may, in some cases, be subject to delays beyond the control of Pool and Hot Tub Depot. Such circumstances could include, but are not limited to: postal/delivery service delays, statutory holidays, inclement weather conditions, etc. Generally, supplies orders are shipped within one to to three business days. We do not ship on Saturdays, Sundays, or on statutory holidays. Most supplies are shipped from one of the Depots across Canada. Most products ordered for delivery in Canada are shipped via Canada Post Expedited Parcel, Purolator or UPS ground with some orders shipped via FedEx. Shipping confirmation is automatically emailed by our automated system within 24 hours of the day your order is shipped. 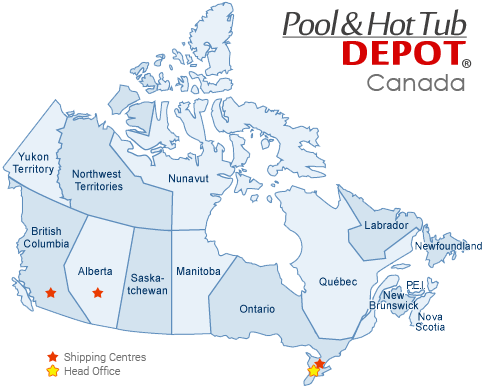 As of May 12, 2014 Pool and Hot Tub Depot expanded shipping to ship from different shipping order fulfillment centres across Canada. Your order will always be routed to ship from the closest shipping location to your address, product and stock permitting, on rare occasion the closest location may temporarily be out of stock on the item(s) ordered in which case your order will ship from the next closest shipping location. Please note that some items are only available to be shipped from certain location to all of Canada and may experience 2 - 4 day longer transit times to to some locations. If an item is only shipped from a specific location it will be noted in the items description. Pool and Hot Tub Depots main warehouse and head office are located in London Ontario. All other locations that products ship from are fulfillment centres. Pool products ship to all of Canada from Ontario only. Generally, spa parts are shipped out within one to three business days. We do not ship on Saturdays, Sundays, or statutory holidays. Most products are shipped from the one of the locations across Canada. In store shopping and online purchases can be picked up at the London Ontario Depot. Heavy or bulky parts orders for delivery in Canada are usually shipped Canada Parcel Post or Purolator ground for delivery in 3 to 7 business days (not counting Saturday, Sunday, or statutory holidays). Small lightweight parts may be shipped via Canada Post Expedited Parcel, Purolator or UPS ground . Your order may arrive in multiple cartons, and on different days.